London, 17 January 2018 - The United Synagogue has been awarded a £1.7m National Lottery grant from the Heritage Lottery Fund (HLF) to open Willesden Jewish Cemetery as a place of heritage for the public. Money raised by National Lottery players will go towards Willesden Jewish Cemetery “House of Life”, helping to create greater public access at one of London’s most remarkable cemeteries and to engage new visitors with the stories of people buried there since Victorian times. The confirmed grant of £1.7m forms part of a £2.3m project designed to put the cemetery on a sustainable footing for the future. Willesden Jewish Cemetery was opened in 1873 by the United Synagogue. With most of its burial spaces occupied, the grounds are relatively little visited and largely unknown beyond the Jewish community. The National Lottery funding award announced on Wednesday follows a two-year development with HLF support in which the US progressed plans to conserve buildings and a small number of memorials, green the landscape and improve bio-diversity, and to offer activities, volunteering and training opportunities for a greater number and range of visitors. Michael Goldstein, President of The United Synagogue, said: “Our community has long valued Willesden Cemetery as a significant place of memory. Thanks to the generosity of National Lottery players we are now poised to open it to the public, fostering greater understanding of our heritage and way of life. Willesden Jewish Cemetery is the only Jewish cemetery on the Register of Parks and Gardens of Special Historic Interest in England. 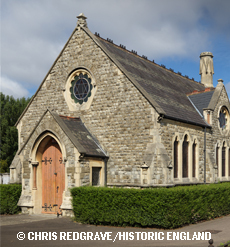 Funerary buildings, the UK’s first national Jewish war memorial and three tombs were listed Grade II by Historic England in 2017. Among 29,800 graves are those of hundreds of people famous in their day, from pioneering scientist Rosalind Franklin to Tesco founder Sir Jack Cohen —as well as many others whose stories have not been widely told. A place of great tranquillity, the cemetery charts the development of London’s Jewish community over nearly 150 years, with graves and memorials rich in social history and genealogical detail. Innovative plans by the United Synagogue reflect growing public interest in cemeteries as places to preserve community memory, explore issues around identity, and open up discussion of death and burial custom. While some UK cemeteries have received public funding to deepen visitor engagement with their heritage, the United Synagogue is understood to be the first recipient of a grant of this size to share a Jewish cemetery’s heritage with wider audiences. A three-year project combining capital works and an exciting activities programme is scheduled to start by late spring 2018, subject to receipt of planning approval from the London Borough of Brent for adaptation of the Lodge and maintenance compound, and the raising of the required additional funding. From 2019, The Edwardian entrance Lodge will be refurbished as a visitor welcome centre. Claire-voie openings in the Pound Lane exterior wall will afford views into the cemetery, with new planting along paths. Conservation of the original Prayer Hall and linked funerary buildings will serve the needs of funeral visitors, as Willesden will remain an active burial ground for decades to come. Adaptation of these spaces will also provide facilities for school visits, talks and exhibitions. The stories of people buried at Willesden and histories of the Jewish community will be told through guided walks, talks, films, signage, maps and a website. Activities will start from later in 2018, ranging from genealogy to creative writing and photography. Temporary exhibitions will showcase Jewish history as part of local and London heritage. Visitors will be encouraged to contribute their own family’s stories to the project. The “House of Life” aims to engage an audience of some 30,000 people over three years from among schools, local residents, Londoners and tourists. Willesden Cemetery will become a hub for volunteering, with people of different backgrounds developing skills and working together to capture, protect and share the site’s heritage. There will be many opportunities to volunteer in one-off, seasonal or continuing roles. Volunteers will work alongside United Synagogue staff to plant new gardens, steward events, catalogue graves, host school groups, develop exhibitions and research histories. The United Synagogue is the largest synagogue movement in Europe, representing 62 orthodox Jewish communities, mainly in London. It manages and maintains 15 cemeteries across England, with four in London still open for burials. The United Synagogue will mark the 150th anniversary of its founding in 2020. Thanks to National Lottery players, we invest money to help people across the UK explore, enjoy and protect the heritage they care about – from the archaeology under our feet to the historical parks and buildings we love, from precious memories and collections to rare wildlife. www.hlf.org.uk. Follow us on Twitter, Facebook and Instagram and use #NationalLottery and #HLFsupported.